The world's most famous web-slinger has been enjoying a lot of time in mainstream pop culture as of late. Last year, Tom Holland took on the role of Peter Parker in Spider-Man: Homecoming, which was well received by fans. Holland also reprised the role in this year's Avengers: Infinity War, which is the highest-grossing movie of 2018. Spidey has proven to be a big hit in video games as well, as the new Spider-Man game on PS4 has become the fastest-selling game of the year. There's been a lot of the web-slinger to go around lately, but there's even more yet to come before the end of 2018. This December will see the release of Sony's animated film Spider-Man: Into the Spider-Verse, which will be unrelated to the MCU films featuring Tom Holland. Interestingly, this will feature the Miles Morales version of Spider-Man seen in Marvel Comics, with Peter Parker serving as his mentor. 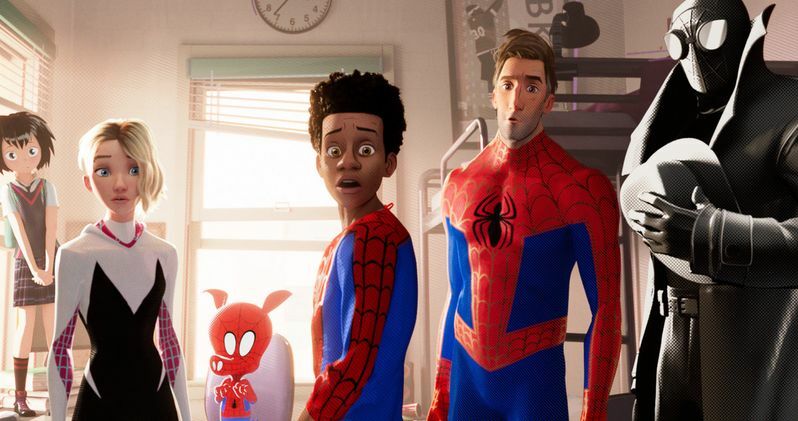 Directed by Bob Persichetti, Peter Ramsey, and Rodney Rotham, the film tells the story of how Miles Morales becomes one of many different superheroes to wear the Spidey suit. Shameik Moore (Wild 'n Out) provides the lead voice of Morales, a half-Puerto Rican, half-African-American high schooler. The story will follow his struggles of trying to balance his issues at high school and his secret life as a superhero. Stars such as Nicolas Cage, John Mulaney, and Kimiko Glenn will be playing the alternate web-slingers. These include Spider-Gwen, Spider-Man Noir, and perhaps most exciting for old school Marvel fans who like their comics on the weird side, here we get to see Spider-Ham swinging into action for the first time on the big screen. We also get to see some of the villains in action, including Green Goblin and Scorpion. The cast also includes Hailee Steinfeld as Gwen Stacy, Mahershala Ali as Uncle Aaron, Jake Johnson as Peter Parker, Liev Schrieber as Kingpin, Lily Tomlin as Aunt May, and Brian Tyree Henry and Luna Lauren Velez as Mr. and Mrs. Morales. Previously, Sony released an official trailer for the film, giving fans an idea of what they can expect from the animated feature. Now, an all new trailer has been unveiled, showcasing even more of Into the Spider-Verse. The visual style of the animation is unique, and rather different from other animated superhero films we've seen in the past. Apparently, up to 140 animators were called in to work on the movie, which is the most ever used for a film by Sony Pictures Animation. Its Morales-centric story seems very compelling as well, and the movie is going to be must-see for every big fan of Spider-Man. Watch the trailer in its entirety below. Spider-Man: Into the Spider-Verse will be released in theaters on Dec. 14, 2018. The live-action version of the webslinger will return to theaters on July 5, 2019, as well, as Tom Holland is reprising the role again for Spider-Man: Far from Home. It is likely the character will also appear in the untitled Avengers sequel due out in 2019, so as long as the survivors figure out a way to reverse the effects of the Thanos finger snap. That movie will arrive on May 3, 2019 from Sony Pictures.